Even without any context a battle through the Force bond sounds incredibly epic, and it won't be the final battle anyway, not if it's really Kylo and Rey and Palpatine isn't involved. I've seen some speculation that Palpatine won't really be there and will only be in flashbacks, but there's just no way IMO. Not with JJ going on record saying Palpatine would be in the film. When they say he'll be in it I'm pretty sure they mean he'll actually be in it, otherwise they might as well have straight-up lied in the trailer and interviews. Again, it's not a case of "Finn has a lightsaber therefore he's a Jedi" thing that relied on people jumping to conclusions based on a single scene with no confirmation, it's literally "this character will be in the movie". JJ couldn't have been referring to anybody else when he said "the biggest evil". @FrolickingFizzgig wrote: Even without any context a battle through the Force bond sounds incredibly epic, and it won't be the final battle anyway, not if it's really Kylo and Rey and Palpatine isn't involved. I've seen some speculation that Palpatine won't really be there and will only be in flashbacks, but there's just no way IMO. Not with JJ going on record saying Palpatine would be in the film. When they say he'll be in it I'm pretty sure they mean he'll actually be in it, otherwise they might as well have straight-up lied in the trailer and interviews. Again, it's not a case of "Finn has a lightsaber therefore he's a Jedi" thing that relied on people jumping to conclusions based on a single scene with no confirmation, it's literally "this character will be in the movie". JJ couldn't have been referring to anybody else when he said "the biggest evil". Ian was also on set, JJ was surprised his presence wasn't even leaked. It was right under our noses the entire time, including all the connections between Solo and the ST. I actually wouldn't be surprised to see Rey and Kylo team up earlier than many would anticipate. They're already not marketing him as the big bad, he wasn't wearing the mask in the trailer or stills, and he just looks miserable and beat-up. And he also still clearly really wants Rey. These scenes all appear to be within the first half-ish of the movie. His marketing is a bit ambiguous right now to those who aren't explicitly on the Bendemption train, but ambiguous is way more than I expected at the beginning of marketing, compared to TLJ ignoring him or painting him in a bad light until 2-4 months before release. So I've been seeing different theories as to what is going on in the beginning of the teaser, and I just wanted to voice a few things. I've read that sometime during the movie, there is this fight between Rey and Ben across the Force bond that takes them to different locations and they somehow jump between places. What if the whole desert sequence is from that? It would explain why Rey is standing in the middle of a desert, no one else in sight, and she is already breathing hard and looking to the horizon, expecting Kylo to pop up in someway. Maybe they just got done fighting somewhere else and were suddenly teleported to the desert? Also, there was talks of a dream sequence between them and this could still fit into that. Of course, this is all just speculation. I'm really hoping the whole movie isn't about Rey and Ben fighting each other and being at odds the whole time, which I've seen hinted at. No way they fight the entire movie. It seems like they are at odds twice-- the beginning and the climax of the film. I bet they get along somehow in the middle and then it turns out Kylo isn't as cooperative as he might have appeared at first. *Then finally he makes a complete heel turn. This is the only thing that makes sense if we consider MSW a credible source, because the marketing for the film right now is not hinting at this and instead are focusing on a romantic end-game. Yeah it’s weird, we definitely need more context. Having said that, the spoiler about Kylo being summoned by/consulting the Oracle and struggling to reconcile his feelings for Rey (which was cited specifically as love by the leaker’s source), - well that was described as being where we pick up with his story in IX, so at the beginning. So it seems like JJ will be making Kylo’s feelings about Rey explicit fairly on, which I am kind of surprised by, but bodes well in terms of the angst. It really ups the tension and stakes for the GA (many who are still clueless) when they fight. What a treat all this activity is! Loving reading everyone's thoughts! For TLJ did we have a thread of it's own happening to bring together locations and sources as they come in to figure out the overall chronology and where the characters are at? I can't remember! @KiraRen2015 wrote: @DeeBee With this and what @VaderIto has said, maybe that sand trail behind Finn and Poe is from Kylo's Tie Fighter. Maybe Rey has insisted she meets him alone or (and I hope this isn't true) that they are planning to capture him or something? Or at least get themselves ready for taking him on since Poe and Finn have no reason to trust him and wonder what his motives are. -I don't know.. I'm leaning toward that being the chase we see in the teaser - where they are being pursued by what looks like a couple of storm troopers on bikes - it's very fast and there's lots of sand so I don't really trust my eyes at the moment. lol. @vaderito wrote: @DeeBee Bingo on Poe's biceps. Death Star is after Jordan. Can you find Poe on Forest planet? I think figuring out the order of things is a bit of a slow burn. I'm not going to figure much out for sure from a first quick teaser. I'm not even convinced all the footage in a desert is from the same planet or same sequence. There was talk at one point of there being more than one planet with a desert location. We'll see! I wouldn't be surprised if Rey was on one desert planet, while Kylo/Ben visits Tatooine! we know so little at this point.. and with the force bond - anything with Rey and Kylo/Ben only is tricky to pin down for me.. but I love reading all the speculation and exploring ideas! we need image from Snow planet but that isn't out yet. -ah! I see you answered your own question while I was asleep.. cool image that thanks for sharing! This green location - are we thinking it is jungle? or forest? 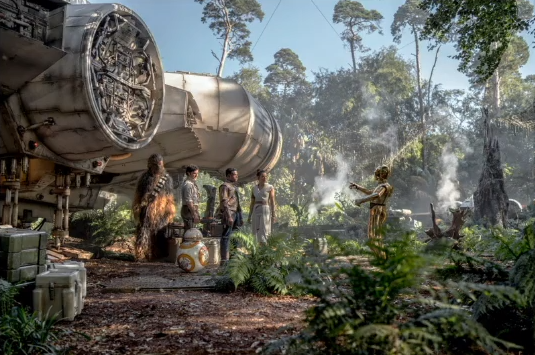 Does Batuu have jungle? I haven't heard that it does.. There are more images of green locations floating around.... I'll try and bring them together...Maybe the green location is two different locations - Batuu being one of them.. and the other currently unknown..
@rawpowah wrote: So if the grassland/Death Star planet is after the desert planet (where we know Kylo is present), then where is Kylo after that part of the movie? What happened to him? -indeed! Great question.. Maybe together we can figure all this out over coming months... Maybe Kylo/Ben isn't present in the desert and we only see him there through the force bond. It's curious that we didn't see him during that sequence... Or maybe Rey is the one who isn't really in the desert at that point.. we know so little.. and the force bond is trixie! The whole 'Kylo crashes on Ach-to and he is definitely there' thing has me being extra cautious I guess! Making Kylo’s feelings about Rey explicit early on wouldn’t surprise me; the controversy surrounding Reylo was never about Kylo’s feelings, it was about Rey having feelings for a toxic abusive Nazi incel etc. They don’t need to tiptoe around Kylo’s feelings at all in the same way, and they didn’t even really do it in TLJ. Just a hunch, but I wonder if Kylo reforges the mask in the movie specifically for his second encounter with Rey. So far I can’t really trace the logic between mask/no mask. @Saracene wrote: Making Kylo’s feelings about Rey explicit early on wouldn’t surprise me; the controversy surrounding Reylo was never about Kylo’s feelings, it was about Rey having feelings for a toxic abusive Nazi incel etc. They don’t need to tiptoe around Kylo’s feelings at all in the same way, and they didn’t even really do it in TLJ. I told two of my coworkers the spoiler about Kylo's feelings and there exact response to me was "That isn't a spoiler. We already know he feels that way." and they aren't reylos either. I'm interested to see where in the movie he wears the mask because it doesn't seem like he will be wearing it longer than a few scenes. @Casper wrote: I don't think they're meeting at the beginning of the film on the premise that they'll be teaming up. He is trying to run her over with his ship, after all. I think the teaming up happens after she breaks his ship and takes him to the Resistance and the discussion that follows after that. We don't know yet, plus why would he be running her over and not shoot blasters? They might be training. I had edited this post to say 'delete' so it would be deleted, since my post was based on a misreading of someone else's, but for some reason that edit didn’t take. Having said that, I don't believe they're training. I've already said Kylo doesn't really want to kill her. But he thinks he does. Remember this is Kylo-Kill-It-If-You-Have-To-Ren. She rejected him. He can't take that, or the thought of living—or reigning—without her, so he's trying to kill his love for her. He knows that trying to kill her isn’t going to work. She’s too good now, as in too bad***. This man is completely awed by her Force ability because it matches his own. What better way to see that ability on display than to attack her? It turns him on. It’s like a bizarre mating ritual. This is their version of foreplay. I personally do not mind the idea of a darker love story with Kylo lashing out because he's in love, and it does make sense given how he is as a character. However while I may enjoy this dynamic myself, I'm slightly worried that the reylo fandom will forever be plagued by "abusive" discourse even after it's canon. I like that Lucasfilm wants to adapt more of a mytho/tropey feel to the reylo relationship (it's been a long time coming that fantasy/action films accomodate the female-gaze) but I also feel that they should make romantic reylo palatable to the general audience (so we won't have to deal with more BS from fanboys for years onward.) I'm a little split on the matter. Thinking about how they handled it in TLJ and how much softer and easier it was than fandom initially imagined, I am expecting they to bicker for some minutes, have some epic, visually pleasing fight and that's it, join forces to defeat whatever greater threat JJ mentioned (probably Palpatine I guess). I mean he is telling us that light and dark will team up months before the actual movie, I don't imagine it will take too long. I'm inclined to agree that I expect a gentler take. TLJ sped their relationship along far more quickly than anyone could expect. He has one brief moment where he tries to force-make her tell him where Luke is, and they break the saber later. I don't think he knows she's in the Falcon, he just hates the sight of the Falcon. That's it, that's the extent of the violence between them. They were holding hands and telling each other they weren't alone. He wanted her by his side proposal-style. It would be completely bizarre if he regresses even further than his Crait tantrum in this third act of the trilogy. Nothing in this marketing indicates he's any more evul than he was in TLJ. He's just sad and brooding. And this is still a movie for mostly-kid audiences at the end of the day. And it's Disney, we're ending on a hopeful note, so we've been told. I'm still told by almost everyone in my life that knows star wars that I'm crazy for believing anything romantic is happening whether it's one sided or full Reylo, by both men and women. My husband knows im a reylo but doesn't care about romantic elements and I have 1 friend (Male) who is reylo as of recently. My family (parents) and brother either think im crazy or ridicule me (they're longtime sw fans) and my guy friends think I'm making stuff up and my girl friend said she never noticed anything romantic or sexual between rey and kylo. It's been a lonely road for me.... other than you all. Yup, this, basically. After she breaks his ship, he realizes Mama isn't playing anymore, and tries things her way for a while. Some in the thread speculate that "gone" might mean that Leia stepped away from the leader duties, but I really doubt it. I was always sceptical about the extent of Leia's appearance, they can't possibly cobble together enough footage to make it last through the film. I think that the shot with Rey hugging Leia, most likely before she's off on her quest, is probably the last time she's going to see her. This made me wonder if the pic where Kylo sits in his TIE with a miserable hollow-eyed expression has something to do with Leia's death. I think they will have to 'kill off' Leia as well, sadly because of Carrie's passing so early. Man I was so looking forward to Leia in the 3rd movie because she'd get her son back and the bit in Bloodline when she tells Han to think about their future grandchildren when Ben in an infant. Another reason to be heartbroken Carrie's gone. At least they had scrapped footage from TFA but the chances of there being enough to get Leia through the entire film probably wasn't high. It's still better than killing her off-screen or doing the uncanny valley CGI like Rogue One but man so sad. It's also likely another reason why JJ is in charge instead of Trevorrow (thank the maker) because he filmed that footage with her. Added bonus - that part was written by Kasdan. I did see one suggestion that maybe they'll finally show the message she recorded for Ben from Bloodline like Jyn getting the message from Galen. But that would also explain why he looks rekt in the one photo shown (besides being heartbroken over Rey and his new job not being worth all the crap he went through to get it). As for crazy theories, they're out in full force and come December, people are going to lose their minds because what's been obvious all along isn't what they thought was going to happen. Reserve a "JJ Screwed It Up" square on your BINGO card. Especially because there are already hella people ranting and raving about "OMG why was Colbert asking about Rey's love life?! That is so insulting and disrespectful, I am so mad!!!" Which uh, dude sorry to say that you're probably going to be a lot more angry in December and all the squares on your BINGO is going to be what JJ screwed up. They're talking about Will They or Won't They because that's the plot point that most of the audience is invested in. The other thing I've noticed, which is crazy, is that people I follow who are brilliant writers/thinkers have these completely batshit, off the wall theories. Like 100% certain of things like Rey's the product of the Emperor's secret cloning project as a back-up to Vader. Or that she and Kylo are siblings. @vinventure12 wrote: So I've been seeing different theories as to what is going on in the beginning of the teaser, and I just wanted to voice a few things. Were you around when the “Kylo spends the entire movie walking/ stomping around” leak was going on? I think it was for TLJ— a very detailed (fake) leak in which we figured that Kylo spent a good 50% of his scenes striding around purposefully. I think them fighting the entire time is about as likely the Kylo-walking-around leak. @snufkin wrote: Man I was so looking forward to Leia in the 3rd movie because she'd get her son back and the bit in Bloodline when she tells Han to think about their future grandchildren when Ben in an infant. Another reason to be heartbroken Carrie's gone. At least they had enough scrapped footage from TFA to use but the chances of their being enough to get Leia through the entire film probably wasn't likely. It's still better than killing her off screen or doing the uncanny valley CGI like Rogue One but man so sad. I did see one suggestion that maybe they'll finally show the message she recorded for Ben from Bloodline like Jyn getting the message from Galen. But that would also explain (besides Rey breaking up with himand his new job turning out to be a nightmare thanks to Hux and their potential new boss) why he looks in the one publicity shot they released. As for crazy theories, they're out in full force and come December, people are going to lose their minds because what's been obvious all along isn't what they thought was going to happen. Reserve a "JJ Screwed It Up" square on your BINGO card. Especially because there are already hella people ranting and raving about "OMG why was Colbert asking about Rey's love life?! That is so insulting and disrespectful, I am so mad!!!" Which uh, dude sorry to say that you're probably going to be a lot more angry in December and all the squares on your BINGO is going to be what JJ screwed up because they're talking about Will They or Won't They because that's the plot point that most of the audience is invested in. The other thing I've noticed, which is crazy, is that people I follow who are brilliant writers/thinkers have these completely batshit, off the wall theories. Like 100% certain of things like Rey's the product of the Emperor's secret cloning project as a back-up to Vader. Or that she and Kylo are siblings. Re: the cloning theory— remember all those before TLJ? Rey is Anakin 2.0, Rey is Luke’s hand reincarnated(! )...it just doesn’t get that weird. Alcoholic parents sold her for drinking money. Maybe they had an interesting history before they hit the skids and wound up on Jakku, but I’m 99.9% certain that Rey was conceived by regular people through the usual process. There was enough suspension of disbelief required for Anakin’s origins. And then all the telenovela theories— Han cheated on Leia, Leia cheated on Han, Luke had a secret lovechild...and all of these characters whom we loved for their essential goodness and decency dumped a little girl with Unkar Plutt on a wretched junk planet. Deadbeat Dad Luke is probably still the worst Star Wars theory I’ve ever heard, but so many people want to believe it. Rewatching the trailer, I've belatedly realised that the 'leap' Rey does at the beginning won't take her over the ship but instead will land her directly on top of it! It reminds me of the Captain America leap into an airplane from The Winter Soldier!